THIRTY years of deforestation in the temperate regions has caused more pollution than 140 years' use of forests in the tropics. When' temperate forests were cut down in the 19th century by the colonial Europeans 12 North America, New Zealand, Australia, South Africa and East Europe, they put into the atmosphere at least one-and-a-half times more carbon per year than the Current annual carbon released from the tropics - 3.6 billion tonnes of carbon per year as against 2.4 billion tonnes today. The trees were chopped to clear more land for agriculture in these regions. The amount of carbon released in the 30-year period between 1860 and 1890 is estimated at 110 billion tonnes. In comparison, the historical expansion of tropical croplands released only 75 billion tonnes of carbon over a 130-year period from 1850 to 1980. This contrast has been brought out by Marco Antonio Ferriera Rueno and Maria Elisa Marcondes Helene from the Ingtituto de Estudos Avancados, Sao Paulo, Brazil, in a recent review of global deforestation and carbon dioxide emissions (Energy and Environment, Vol 2, No 3). Deforestation has historically been a temperate zone phenomenon, they say. About 50 per cent of the world's forests were located in the temperate region, of which some 90 per cent (20.6 million sq km) were found in the northern hemisphere. With the brutal expansion of agricultural lands in North America, New Zealand, Australia, South Africa and East Europe by the colonial nations of Britain, France, Spain, Portugal and the Netherlands, concentrations of atmospheric carbon dioxide increased by almost 10 per cent in the last half of the 19th century, against the 30 per cent increase caused by the anthropogenic carbon-releasing activities from 1850 40 the 1980s. Deforestation since the 1960s, however, has occurred almost exclusively in the tropics, while the total temperate forest area has stabilised. 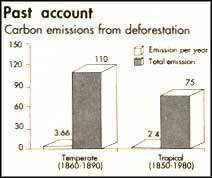 Today tropical deforestation is believed to cause 33 per cent of the annual increase in carbon dioxide, However, Buena and Helene stress that current carbon dioxide emissions from deforestation are occurring concomitantly with fossil fuel emissions, 22 per cent of which occurs in USA alone. Tropical deforestation has acquired political connotations with growing international concern for global warming and erosion of biodiversity. Governments and scientists from the industrialised world are holding tropical deforestation responsible for a large proportion of anthropogenic carbon emissions.